Cut bell peppers in half lengthwise; discard seeds and membranes. Blanch for 2 minutes. Pat dry and place in a casserole dish - the bottom of the dish should be covered with a thin layer of tomato sauce. In a pan, add olive oil and saute the onions and bell pepper until soft (7-9 minutes). Add minced garlic and mushrooms and cook for 2 minutes. Add the ground turkey and spices and cook until the turkey is no longer pink, breaking up the turkey as it cooks. In a large bowl, combine the cooked ground turkey, cooked wild rice, diced tomatoes and Parmesan. Add salt and pepper to taste. Scoop mixture into each bell pepper half. Top with a scoop of tomato sauce and grated mozzarella cheese. Stuffed peppers are yummy. I usually use lean ground beef with lots of spices, but your recipe sounds delicious. 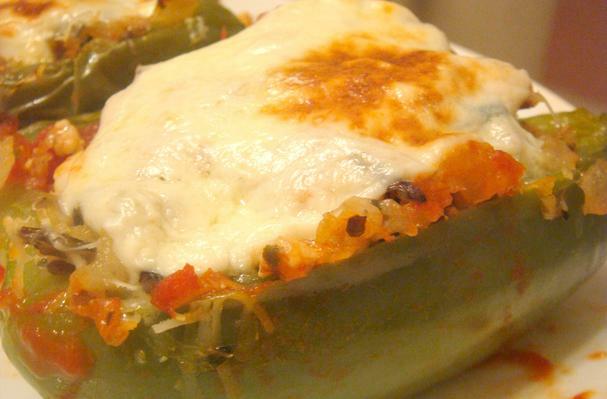 I love these stuffed pepper! It's a great and tasty way to use a package of lean ground turkey. Anything stuffed into a bell pepper is just good. My favorite bell peppers are the orange ones. I like the subtle sweet flavor they have once they're baked. If you want to make this recipe super healthy, just leave out the cheese. Either way, this a great meal for any night of the week.